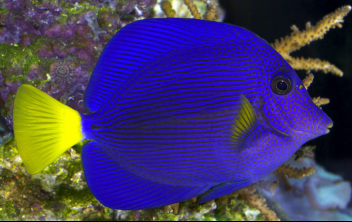 The purple tang or yellowtail tang (Zebrasoma xanthurum) is a marine reef tang in the fish family Acanthuridae. The fish grows to a maximum length of 25 cm (9.8 in) in the wild, but rarely surpasses 20 cm (7.9 in) in captivity. Z. xanthurum inhabits the Red Sea, the west coast of India, the east coast of Africa, and the Persian Gulf, where it may live at water depths of 1 to 20 m (3 to 65 ft) or more. It is a popular fish in the aquarium trade. It is a herbivorous fish, eating primarily filamentous algae, but is omnivorous in its juvenile stage; it becomes increasingly herbivorous as it matures. 1. ^ Carpenter, K.E., F. Krupp, D.A. Jones and U. Zajonz, 1997. FAO species identification field guide for fishery purposes. Living marine resources of Kuwait, eastern Saudi Arabia, Bahrain, Qatar, and the United Arab Emirates. FAO, Rome. 293 p.